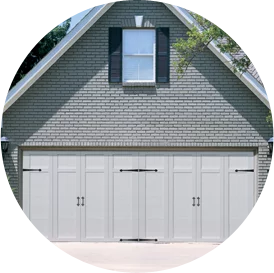 Is it time for you to install a new double-car garage door? The garage door experts at Overhead Door Company of Greater Cincinnati can help! Whether you’re hoping to install windowless modern doors or traditional raised panel doors, our professionals can help you figure out the perfect solution for your home. We have an extensive collection of colors, looks and materials for you to choose from! Ready to learn more about our two-car garage door installation services? Call today at 513-394-6938 513-394-6938. Standard garage door sizes are whole-width increments starting at 8 feet wide and going to 20 feet wide. However, some series have sizes smaller than that. Standard heights are 7 feet and 8 feet tall. Other heights and widths are also available and vary by individual series. We can also install multiple smaller doors to accommodate a large space. Additionally, we can install large commercial garage doors for warehouses, storage facilities, auto shops and much more! In addition to installation services, we offer double-car garage door repair. One of our repair professionals will come out and assess your door, find the source of the problem, explain what’s happening and fix it. Are you ready to add a new double-car garage door to your home? Contact the garage door professionals at Overhead Door Co. of Greater Cincinnati and we can show you our versatile collection of garage door designs, colors, materials and more. Give us a call at 513-394-6938 513-394-6938 or fill out a contact form today!